NON-TOXIC, FOOD SAFE, ONE COAT, NATURALLY EFFECTIVE WOOD FINISH AND STABILIZER! Odie’s Oil Covers 20 Times the Area of Conventional Wood Finishes! A little Odie's Oil goes a long way! And Odie’s Oil is food safe and can be used on all wood surfaces, interior and exterior. Odie's Oil stands up to the competition and wins! Coverage for a 2400 sq. ft.
Odie’s Oil uses the finest oils and waxes produced by nature to protect your wood surfaces. These oils and waxes evolved in nature to protect plants from the constant bombardment of the elements, insects, fungi and other bio-organisms. 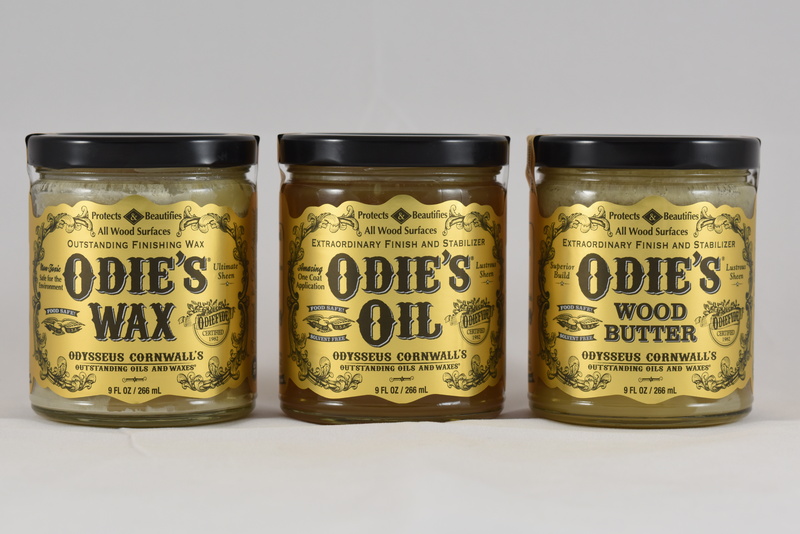 The oils and waxes in Odie’s Oil are at home in wood because wood is where they originally evolved. Odie’s Oil is the most natural and effective way to finish a wood surface by bringing you the best of nature, today’s technology, and the time-tested knowledge of the ancient masters. This single amazing finish can be used anywhere and is so easy to apply that almost anyone can use it with success. It is not complicated to use. Wipe it on. Buff it off. Now how easy is that? Odie’s Oil contains no toxic solvents, driers or hardeners. Since it is food safe, it is safe for your family and pets. It is the most convenient finish to work with and maintain. You can easily maintain Odie’s Oil without sanding between coats. Just apply a little more where needed and there is no overlapping! The wood only accepts the Odie’s Oil where it is needed. Odie's Oil Resists Stains, Moisture and Water! The concept behind Odie’s Oil is “what is applied to the wood is what stays in the wood”. The wood surface and pores are completely saturated with the oils and waxes in the Odie’s Oil that is applied, so there is no room for unwanted water, moisture or stains from wine, oil, grease, juice, etc! Odie’s Oil contains no solvents, so almost nothing evaporates from the application during the drying process. The wood pores remain saturated with oils and waxes. This is why Odie’s Oil is effective in one coat! Additional coats can be applied depending on wood species and desired visual effect. We like to encourage our customers to experiment with application. 1. Use no solvents (don’t dilute). 2. Always buff the finish to a beautiful sheen sometime after application and buff the surface until it feels smooth and almost dry to touch.